Award winning leaders in labour saving equipment, Healy Group's repuation has been built on Quality, Support, Customer Care and Service for over 20 years. As an Australian owned family business we recognise the need to make your working life easier and safer. ✔ 408kg Max Lift Capacity. ✔ 1 Hour DIY Install. The SpitzLift 900 Lightweight Portable Crane with the surface plate is designed to mount to any solid horizontal surface. Applications include service bodies, vans, roof racks and any confined space. 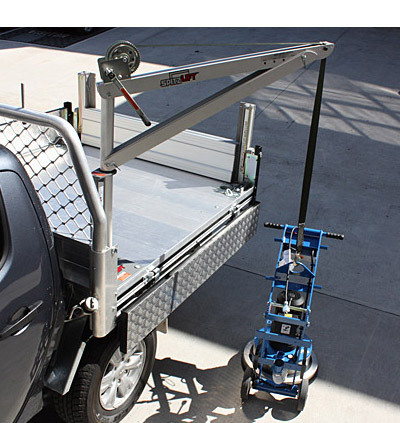 Multiple plates can be mounted to all doors of a van, racking or job site and utilise the one crane. One person can easily set up and operate the crane saving in labour and alleviating many OH&S issues. The crane and pivot tube can be left permanently in place and is light enough to quickly dismantle and store in minutes. Weighing as little as 26kg SpitzLifts are engineered and manufactured out of aircraft grade aluminium and can lift 408kg. Lightweight, portable, and payload efficient. SpitzLifts are also OSHA and ASME compliant. With manual operation there are no power devices or hydraulics to fail. With innovative technology is an important EHS resource that safe guards employees against injury – reducing work-place injuries, lost time, accidents, and worker’s compensation claims. SpitzLift’s rugged, ergonomic design is robust and able to operate without failure in extreme conditions from -50°C to 140°C. It is corrosion resistant, durable, and will stand the test of time. The crane can be mounted on the right or left side of your vehicle, and will rotate 360 degrees. Simply install additional mounting points on other vehicles and work sites and the crane can be shared around. When not in use the aluminium crane body, weighing only 14kgs, can be folded and stowed away in a toolbox or rear of vehicle leaving precious tray and floor space completely clear. Various attachments are available for the crane to be utilised on table top utes, style sided utes, vans, trucks, trailers, boats, workshops even scaffolding. See product options below. Available in manual and 12v or 24V DC Electric option with wiring harness, fuse, quick connect lead and pendant remote control. Also comes with all mounting hardware and installation instructions. Utes, Service Bodies, Enclosed Service Bodies, Flatbed Trucks, Vans, Military and many special applications. Total weight of crane packages varies according to mounting arrangements. Designs and specifications subject to change without prior notice. Dimensions are subject to technical change, errors and translation mistakes. SPITZLIFT cranes are made from structural aluminium and are anodized for maximum corrosion resistance. All models are full range, dynamic static load tested and certified. 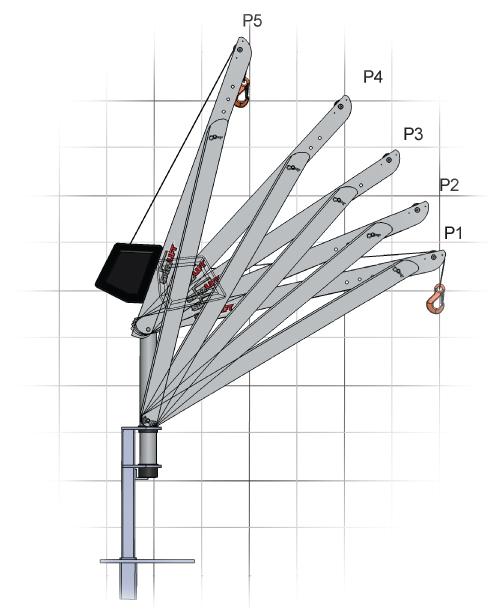 Weighing around 14kg (total payload-to-vehicle weight is less than 45kg for SpitzLift and mount). No additional reinforcement or pedestals are required. 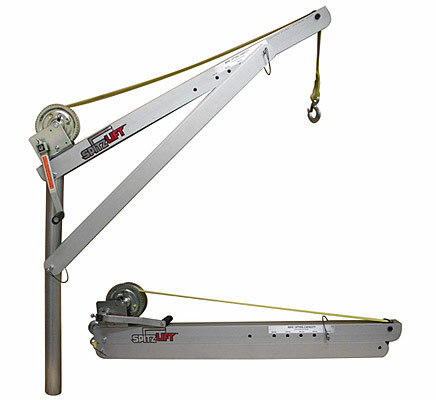 Healy Group are Australian distributors and importers of the Spitzlift Lightweight Portable Crane. As one of the largest SpitLift distributors in Australia, you can rely on us for local service and support. We want you to love our SpitzLift and as much as we do. We offer a full 1 year manufacturers warranty on all parts and labour. Just another reason why more Aussie tradies are using SpitzLift Portable Cranes. Healy Group offers a number of delivery methods throughout Australia and the Pacific for your convenience. In store pickup available business weekdays and other times by arrangement. Payment can be made during the checkout process by Mastercard and Visa or you can call us to make a payment over the phone. Alternatively, contact us and we can supply an invoice which can be paid by direct debit. Credit card, cash and EFT available in store and cheque by arrangement. We know you want your products fast, which is why we use several delivery couriers depending on your location. Please use the below as a guide as only. To calculate your shipping add items to your cart and enter your delivery postcode at cart or checkout and select estimate shipping for a more accurate quote. Please note regional country areas in states Western Australia, Northern Territory, South Australia and Queensland attract substantially higher costs for heavier deliveries. Orders placed and paid for by 11am will generally be dispatched the same day. We only dispatch to residential and business address on weekdays, some items can go to a post office box but must be under 3kgs. Please request when ordering. Delivery of large/bulky goods may require a forklift on site or can be requested to be picked up from a Toll Express or Hunter Express depot. We do not offer tailgate deliveries. If there are low stock numbers or any delays you will be notified and given an ETA for dispatch. Please contact us for pricing and approximate delivery time. All orders require a signature upon delivery. If there's no one available to sign for the order, or a 'to the door' service is not available in your area, a card will be left with instructions on how to collect your order. Once your parcel has been signed for you will be responsible for any damage to or loss of your items. If the payment capture process is unsuccessful your order will be delayed until alternate payment arrangements can be made. Should the items you ordered fail to reach you within the times quoted above please contact our Customer Care Department on 02 9525 5522 or email us using the contact us option from our online store. For information regarding tracking your order, see the Track Your Order page. We manufacture and distribute a range of quality brands. © Healy Group All Rights Reserved.